As a Bronze STARS accredited school, we are committed to educating our students about safe and responsible travel, as well as encouraging them to travel more actively when they are able to. We therefore wanted to make you aware of an amazing free opportunity that is available to our students during the upcoming Easter holidays. 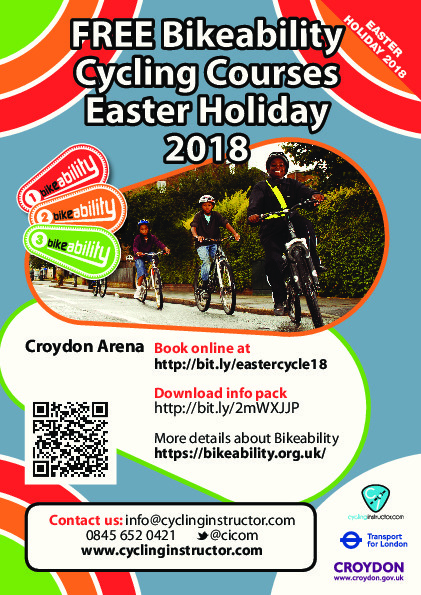 This April, in partnership with cyclinginstructor.com, Croydon Council are offering FREE Levels 1-3 Bikeability training at Croydon Arena for young people aged 7-15. The sessions will take place during the second half of the Easter holidays and the aim of these courses is to give young people the skills they need to cycle confidently and safely on quiet roads and on their journeys to and from school.